Thanks for stopping by. Today I'm participating the Blended Blog's Gift Guide Blog Hop! If you're stopping by from Leslie's blog, thanks! Happy to have you!! It's no secret I'm a mother of two. My Christmas shopping this year is primarily for a 4 (ish) month old baby boy and a 2.5 year old little girl. This should be fun. I wasn't entirely sure how to come up with this gift guide, but then I thought it would make the most sense to just share Oliver and Annabelle's wish lists with you (as per their letter to Santa, obviously). We'll start with the toddler. She has very definite and concrete ideas of what she'd like to see under the tree... some with a little help from momma. A children's tablet or computer. Admittedly, this is momma's pick. Our sweet girl already knows how to work our tablet and phones nearly as well as we do. I'm hopeful something like this might keep her entertained (wishful thinking?!). Books. Annabelle LOVES to 'read' and be read to. She has a massive collection of books but is always wanting more. Currently, she adores Peppa Pig, so this one is on the list. Instruments. Confession: this is my pick for her. I know, I will very likely be writing a post in a month about how much I can't stand to hear her banging on drums all day BUT this kid loves her music and who am I to deprive her of that? Until I take it away because my head can't take it anymore. Blaze car. She saw this at a friend's house and HAD to play with it (I won't lie, there may or may not have been a toddler fist-to-cuffs over it). So help me, she better play with it if it shows up under the tree. Frozen dolls. Apparently, a dollhouse will not be complete without Elsa and Anna. Obviously. Dollhouse. This is the big ticket item our little girl is just begging for (I may have suggested it). She's consistent is requesting this from Santa but as previously mentioned, is partnered with some Frozen dolls. Here's hoping she's a good girl and Santa comes through because I will love reliving my childhood playing with this with her. Easel. My little artist has been banned to the kitchen table with all arts and crafts. I am a mean mommy. Or rather, I don't want to clean. I figure this is a good solution because I can put it where I want it to go... until, of course, she moves it. Also, it fosters creativity and all. What's on your toddler's wish list this Christmas? next stop on the blog hope is Alison's blog, check out her gift guide HERE (tip: she's giving you her wishlist which will be perfect for your friend, wife, mother etc.). 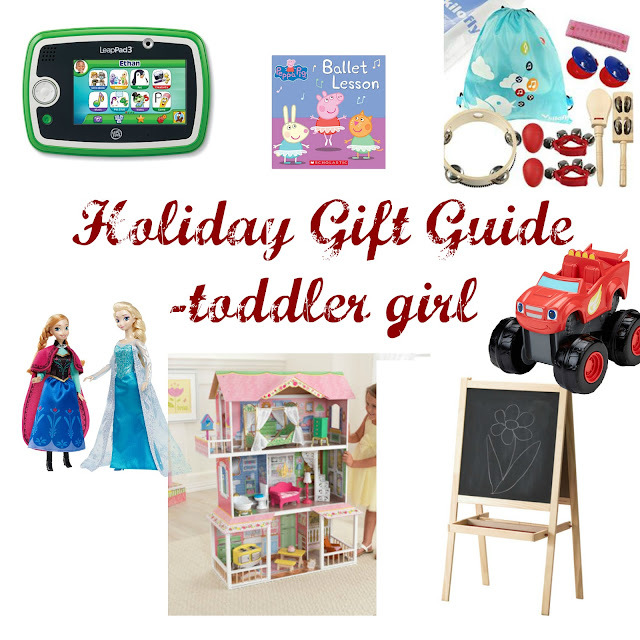 Don't forget to visit the Blended Blog to see all of the other gift guides. If you're anything like me, you're trying to get your shopping done but running out of ideas. Trust me, we've got some great shoppers in the mix this week and they'll find something for the hardest to buy on your list! Stayed tuned for my Holiday Gift Guide: baby boy edition (coming Thursday).